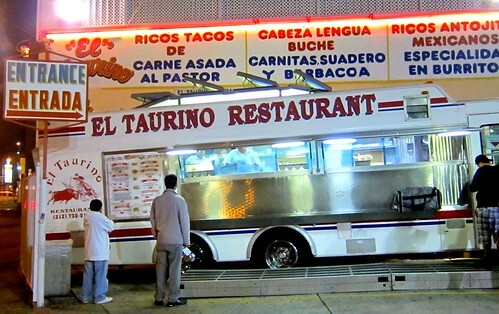 Every Friday and Saturday night El Taurino serves tacos from their truck in the parking lot. 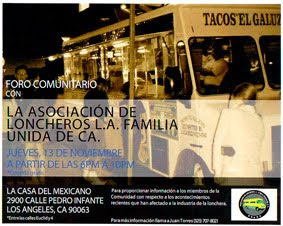 You may wait 20 plus minutes for your order inside, and you can enjoy a beer or two while you wait, but if you want your tacos and you want them now, the truck is the best option. 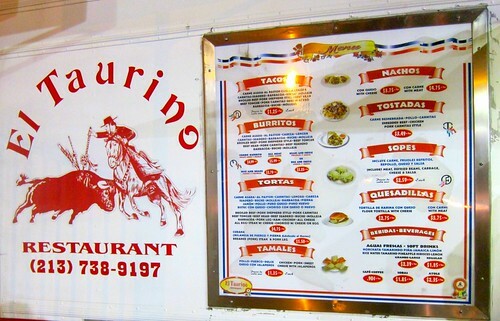 Yes, King Taco owns El Taurino, and other than some minor differences in the menus the food is pretty much identical. The reason to go to El Taurino(or King Taco) is simple, it’s the chile. The salsa roja is legendary in LA, and will give even the most heat-thirsty spice freak a reason to reach for that ice-cold horchata. The meat is fine, and although the price of the all meat burrito has gone up while seemingly getting thinner each year, I still crave the hot sauce now and again. 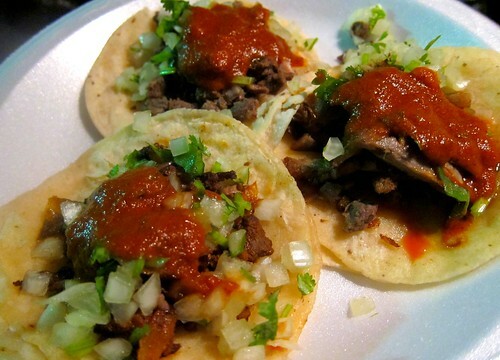 And the best vehicle for that salsa is the tacos de res, asada or suadero, con todo. So that’s what I ordered and to complete the trifecta I opted for al pastor. I don’t usually order al pastor at King Taco or El Taurino. I’ve always found it a bit too onion-ish and dry. For years it was just the carne asada ; the finely chopped beef has always been consistent. You want to taste the chile, and that beefy flavor that rides along can’t ruin the party with any gummy bits of tendon or fat. And the El Taurino carne asada never does. Neither does the suadero. It’s not the best suadero I’ve had by any means; in fact it’s rather tough and dry, but the jerky-like quality of the beef-rib goes well with the chile . Yes, the suadero is pre-cooked and then re-cooked on the flat grill. Next time you go to King Taco or El Taurino order suadero and then listen for the clerk that took your order to belt out “suaaadero!” One of the line cooks will dip into a container and pull out some already cooked rib meat and toss it on the grill. The carne asada is cooked this way as well. After finishing the three tacos I went back for two more suadero. Then the unfortunate happened; I started to hiccup uncontrollably. My face started to turn red as I attempted to get rid of the hiccups by holding my breath. The cook inside the truck garnished my tacos with onions and cilantro and asked if I was sure I wanted more chile.“Yes, I said,” in-between holding my breath and wiping the sweat from my forehead. She hesitated and asked again,“chile?” “Yes, more chile” I said. “I just have the hiccups”, and I hiccuped again as she handed me my plate through the truck window. Both the line cook and the clerk taking the orders were looking at me by now. “No puede comer chile” one of them said to the other. “Si puedo, si puedo” I said and then hiccupped again. It was no use; the chile had gotten the best of me and I was out of horchata. I fumbled through my pockets to find that I was out of money as well. I walked back to my car defeated; I had become the fearless toro seduced by the red of the matador’s cape.